What will Saudi leaders look like in 15 years? I’ve worked in executive search for 20 years, recruiting leaders for Middle East organisations of all types. One of the most interesting countries has been Saudi Arabia, where the types of leaders needed have changed as the Kingdom has grown and diversified. Now Saudi is at a critical point in its development. There is an ambitious future set out in Vision 2030 to transform the Kingdom. At Metin Mitchell & Company, we have been looking at what skills will Saudi chief executives need over the next 15 years in order to help our clients in their recruitment. These skills are what will ensure the Kingdom achieves its Vision 2030. Our interviewees say future Saudi leaders must be inspirational and able to clearly communicate their vision through a period of great change. But alongside this they must be able to make tough decisions as they drive through new efficient operating models and make the necessary cuts. They also need to have an ability to spot opportunities. In my view, the biggest challenge is going to be how businesses transform the way they operate. Saudi needs leaders who can make things happen and achieve a new type of employee culture to deliver this. We asked about the role of women for future success. I was delighted at the unanimous enthusiasm to see more women in senior positions – they are recognised as hard-working and talented and the Kingdom needs their skills. This is certainly reflected in our experience of recruiting – female candidates are generally outstanding. Yes, there are still cultural challenges to achieving more women in leadership positions, but chief executives want to see women promoted within organisations and also welcome the number of women who have studied abroad, who bring wider experiences to the workforce. Our interviewees agreed that while much can be learned from Western CEOs, it is important that key elements of the Saudi culture are not lost – particularly the genuine care for employees and the long term generational view of business. It was good that so many recognised the increased importance of corporate governance – I looked at this in my earlier blog, Will corporate governance create a clear path for Saudi Arabia?. There is no doubt corporate governance will be the big challenge for chief executives of the future. They will have to understand the regulatory and compliance issues, but also learn skills in how to challenge board members – especially when these are more senior family members. Our interviewees had mixed views about how to train chief executives of the future. While international business schools have their place, the general view was that the new generation of Saudi chief executives must work their way across and up a business, so they understand how different disciplines work. So to sum up the key findings, future chief executives will require a different mind-set from that of the boom years. They need to be cost conscious, look for hidden opportunities and inspire their workforces. But get the leadership skills right and Saudi is a country full of opportunities. 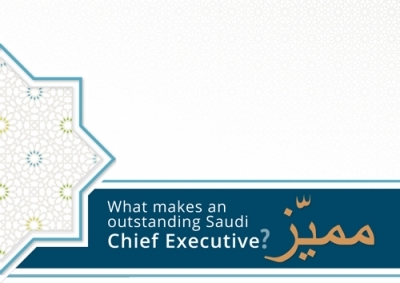 Click here to download a copy of What Makes an Outstanding Saudi Chief Executive. I would welcome other views and am happy to discuss this research in more detail and look at its implications for your own organisation. When should family businesses bring in external chief executives? Could Egypt be the banking centre for Africa?